Extremely durable. I ride over a glass strewn bike path every day, so the extra strength is necessary. And it's very hard to find strong commuter tires in 27 x 1-1/4. Would be nice if there were a little tread instead of being just a slick but I'm not complaining. Tougher than nails. I'm amazed how a little wider tire smoothed out my ride on an aluminum frame. This is my favorite recent upgrade to my road bike. Considerably more volume than 25mm and they allow me to ride on gravel too. If u can squeeze them on your roadie, do it! heavy, not foldable (i don't really care), somewhat more difficult to install. 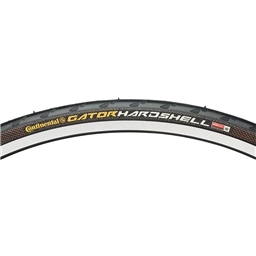 I've had many many recommendations for these tires, and after a season of constant flats, i've finally caved and got them. So far, they've held out very well. They on a less-ridden commuter, so don't get to excited, i don't really have much experience with them yet. All I can say is that it's wonderful not coming out of the office to be presented with a rear flat tire, 10 minutes before your train leaves.